This will be his first bow build, so I am encouraging him to make one by himself. 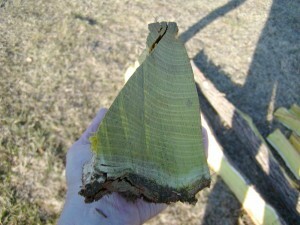 Osage orange is really nice bow wood. 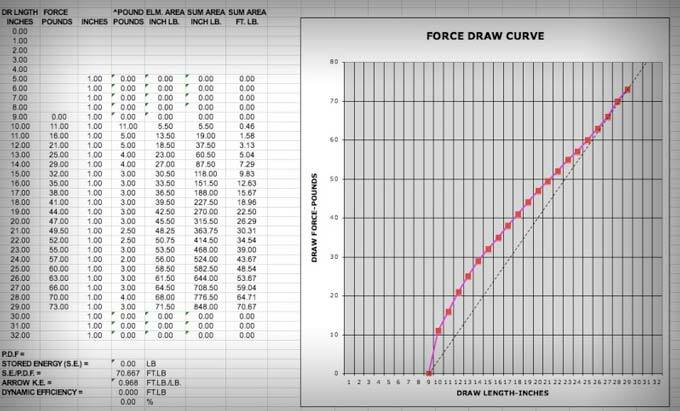 It is rough and tough, and really forgiving wood for a first-time bowyer. Build Your Own Bow author, Jim, poses with the staves. The hedge tree was growing next to the road so he had to top it out first before dropping it so it wouldn’t completely block traffic in the road when it came down. This caused it to split out at the top end of the log, plus it had a really big knot next to the split which limited the number of full-length staves we were able to get out of it. It was about eight feet long and really clean. We started by inspecting the ends for natural cracks, then splitting the log in half from end-to-end by leap-frogging the wedges down the length of the trunk. We started the splitting process by looking over the base end really closely for natural splits and cracks. There were a couple of small cracks in the very middle of the log. 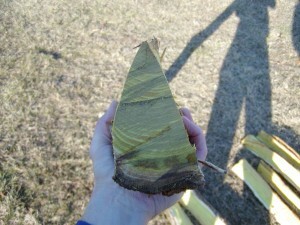 I think one fun thing about splitting a log is trying to guess the way it will tend to naturally split. I’ve cut quite a bit of firewood, so it seems almost instinctive to look at a log and know how it will open up. After making guesses as to the best place to put the wedge, we started by tapping one wedge into the very end of the base of the log. 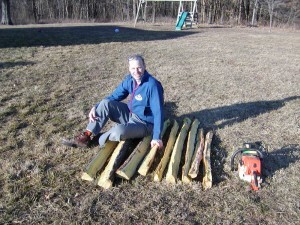 Then I gave it a slam with the sledge hammer and the log popped right in half. Very nice. Then we put the second wedge in about two feet down the log and drove it in until the log opened up enough for the first wedge to come loose. As the crack opened up and extended further down the log, we continued leap frogging the wedges down the tree trunk and driving them in until the log was completely split in half. After that, we split those halves into quarters. 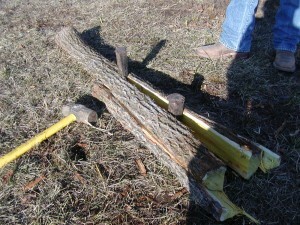 Splitting a log into staves is similar to splitting logs for a split rail fence. 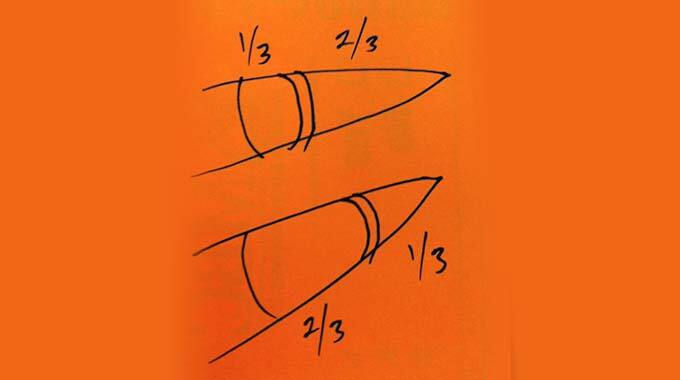 You start on one end and split it from one end to the other. If you try to start in the middle, your wedges will get stuck in the wood and you won’t be able to continue. I lost count after putting them back into the truck, but we ended up with a few full-length staves and several half staves that can be spliced together at the handle to make a bow. Brent took them home and planned to coat the ends with polyurethane varnish so they won’t crack. After that dries, he will spray the wood and bark with insecticide to keep the wasp larvae from chewing holes in the wood. 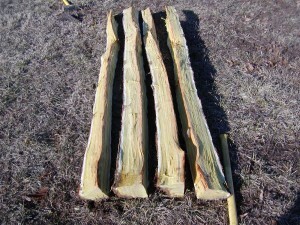 The bark will be left on until the staves are dry and ready to be worked down into bows. The first split opened up into separate halves. 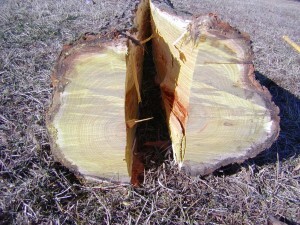 Base of the log showing the rings. Splitting the halves in half. 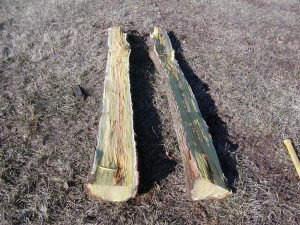 The osage log split into quarters. Brent, the staves, and Macy the doberman. Brent said this this tree was growing in kind of a low spot that was a little swampy. 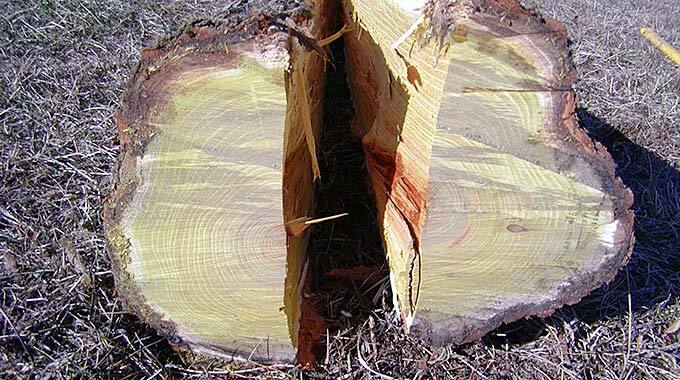 I guess that explains why it had pretty nice growth rings. It must have gotten plenty of water. I did polycoat the ends and sprayed them down with insecticide. Ps gus liked the picture with me and macy he was getting jelous. Very nice! Those staves should be ready in a couple of years? What time of year do you cut the ossage orange tree down Winter -summer ? 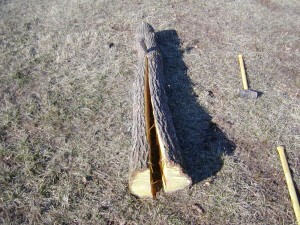 The primitive experts say it is best to cut bow staves in the winter because more of the sap is down out of the tree. 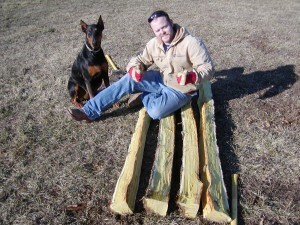 For osage, leave the bark on the staves and split them into about 3″ wide splits. 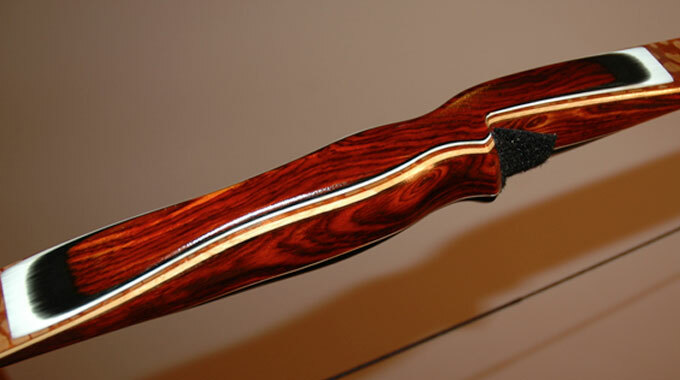 Make sure to seal the ends with shellac, wood glue, or other good paint sealer. This forces the moisture to escape out through the splits and not on the ends which causes cracks.